You are fortunate to have met an enlightened & modern woman. Ask her about her forbears and near relations and you will hear stories that will make you laugh and weep at the same time. At GourmetIndia we have started a disscussion on this topic because many of us have witnesssed precious swathes, not just small numbers, but entire corpus of recipes of certain ethnic traditions vanish with maiden aunts and aged parents. The pace of change is so extreme in India, the dislocation from rural roots alsos so extreme, and the types of foods require space, time, labor, rural products and an extreme desire to sacrifice oneself for the family. Therefore, one prerogative might be to hold closely to such treasures and be lauded for these, slim returns for a life spent laboring over practically nothing. Underlying this is a subconscious bitterness or a complicated psychology that I will leave for more expert minds. Anyway, the net result is that more than 75% of the foods I have known and relished in my childood are completely lost, and unknown to the next generation, which is regarded by many in my generation as some sort of cultural and spiritual savages, irredeemable!! They likewise share a similar view about us! The peninsular masala paste would start with a small red shallot or boiling onion + some cloves of garlic being roasted on embers or hot ashes; on a gas flame, here in the USA. Then, peeled and slowly roasted in oil with some whole spices, then ground to a wet paste. To simplify even more, but lose some depth of flavor & smokiness, sliced or diced onion/shallot & garlic can be slow-roated with whole spices [not too slow because the essential oils will evaporate] & wet ground. aromatic dry red pepper, like BOLDOG paprika or gochugaru whole or ancho, soaked, flesh scraped out, pounded: idea is to create not heat but a flavor base, remembering that the blackened flakes will also add some heat of their own. The whole dish must be pleasant, piquant-warm, on the mild side, no macho heat competition here. You can adjust the spicing to your liking, remembering that there will be coconut milk entering the picture to tame the sharp edges as well as potatoes, plus sweet potatoes & bamboo shoots if you like. Some Cambodians love a LOT of lemongrass, but YMMV. NB: You can also use some anchovy fillets here to good effect, if you do not have/tolerate some of the more exotic fermented fish products. Cornish hens work really well, failing which skinned thighs cut into boneless cubes, throwing the bones into the pot as well. 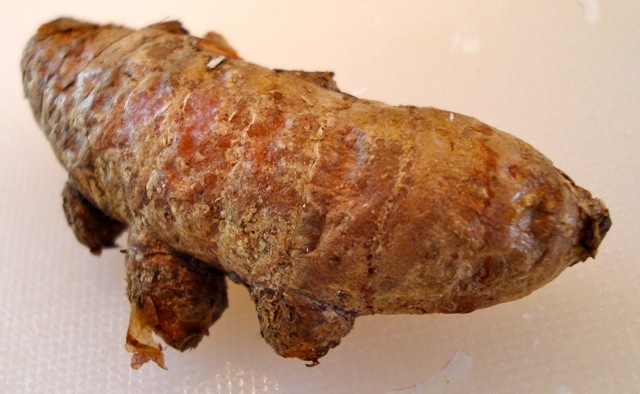 With the Cornish hens or poussins, wash dry, joint and rub with salt & turmeric. This will form a thin coat & prevent spattering +help browning. Lightly brown in peanut oil & set aside. 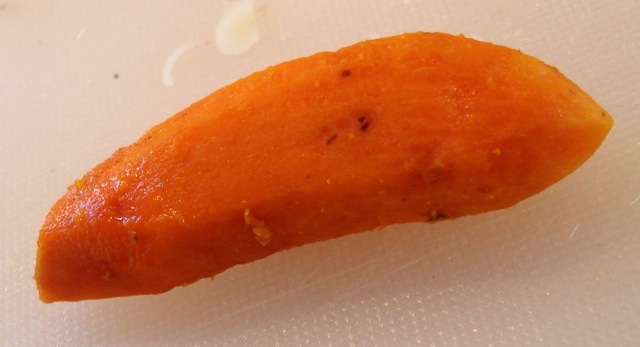 In the same oil/pan, brown halved/quartered russets/Yukon Golds, and sweet potatoes if you like. Next, gently brown a small amount of very finely sliced onions, covering them to wilt, then uncovering them to brown. 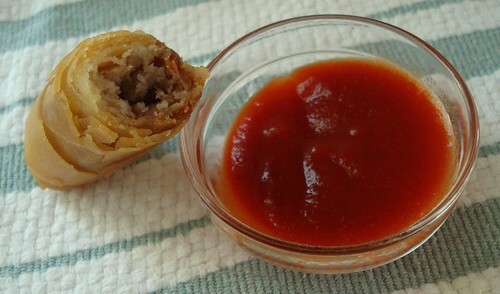 Add a tiny amount of sugar after they are golden, then kroeng paste, cook for a bit, add chicken. 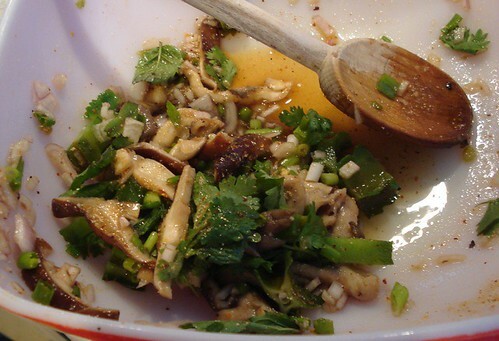 Some like to add cilantro or Thai lime leaves, either to paste or to the pan. Let your tastes guide you. Too many flavors piled on top of one another may be counterproductive. 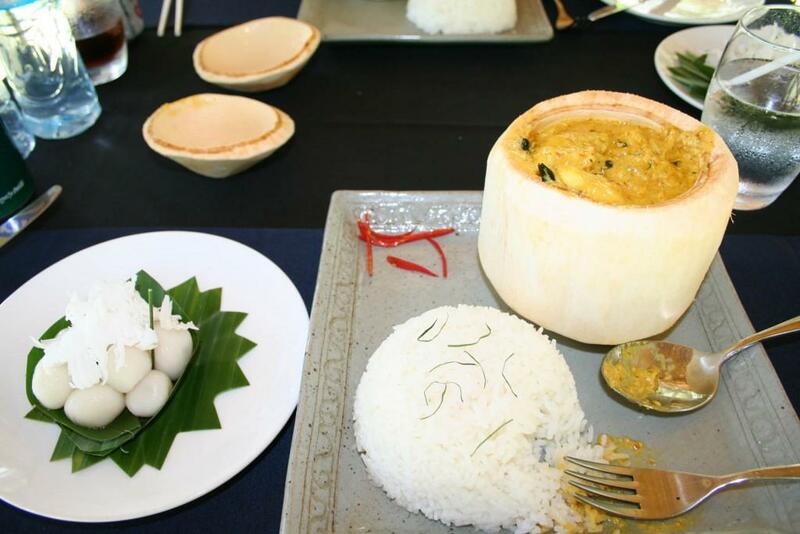 Thin coconut milk may be added now, i.e. the cream spooned off and saved for the very end. Simmer covered, with salt until potatoes, sweet potatoes and or bamboo shoots done. Add a judicious amount of blackened chili flakes. Things will look terrible. Cook a tiny bit longer, like 3 minutes, then add reserved coconut cream and balance seasonings. Correct with fish sace, sugar salt. thanks for the details...it occurred to me that, depending on the amount of oil used for deep frying the peppers, one could strain the oil after the deep frying and chili oil would be the result...so two cooking ingredients for the price of one! 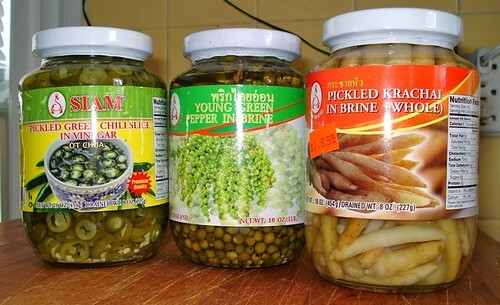 v., I'll try to see what I can find out about the kroeung, but given the focus of the research I'm doing (it's on Khmer-American home cooking), I think I'm going to get variations within a general theme. The kroeung sold at the Narin Market is, I think, very basic: ground (or processed -- no pounding here) lemongrass, kaffir lime, shallots, galangal, and that may be it. No spices, no heat, no roasting in evidence, no garlic -- all iirc. Next time I go I'll pester them to see what I can learn. Turns out a tall white guy buying lort, sdao, galangal, and so on gets a lot of friendly attention/advice. 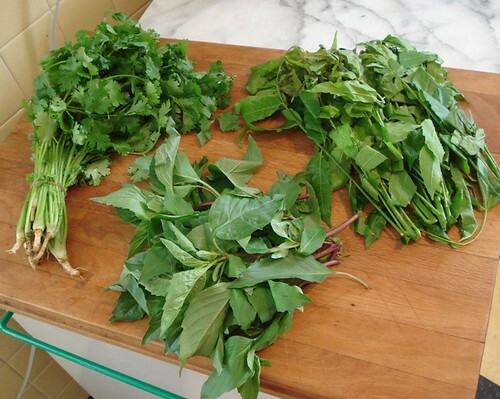 From left to right, cilantro or coriander (with roots -- important), holy basil, and sdao, or what Riviere calls bitter Khmer leaves. Riviere compares them to sorrel, which makes sense only if you add an astringent, bitter edge to the sorrel; spinach would miss the point entirely. I was strongly discouraged from buying sdao by three different people in the store. Left column: winged beans, very fresh today, so I got a few to add to a mushroom salad I was making for lunch; Thai red and serrano chiles; the cleaned and trimmed coriander roots. Center is scallions and galangal. 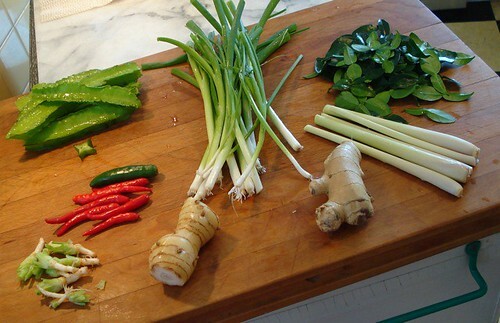 Right: kaffir lime leaves, lemongrass, ginger. 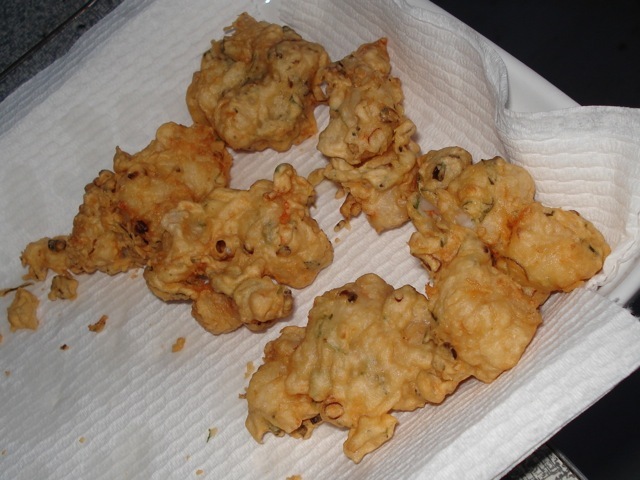 Lort (or lot), the taro, pork, and peanut fried snack (good looking recipe here). I could eat fifty of these per day. Sriracha in the little dish. This very simple recipe is really good. The step that intrigued me was adding the shrimp, garlic, and oil all at once to the caramelizing sugar. I made this in a wok -- mistake -- so I had a hard time reading the darkness of the caramel. I added the shrimp too early, stopping the caramelization before it was sufficiently dark. 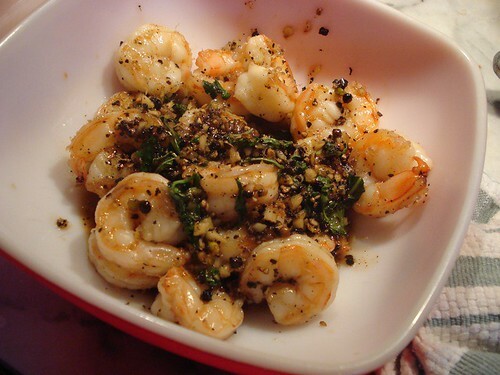 As a result, I was worried about overcooking the shrimp, so I removed them to reduce the sauce and then add the pepper, fish sauce, and coriander. Next time: no wok (stainless saute pan), less oil, and darker caramel. But this was great, the sweetness of the caramel and shrimp playing off the bite of the pepper. I added minced coriander root to the dish to brighten it up a bit, which was a good idea. Here's the grilled eggplant with pork. 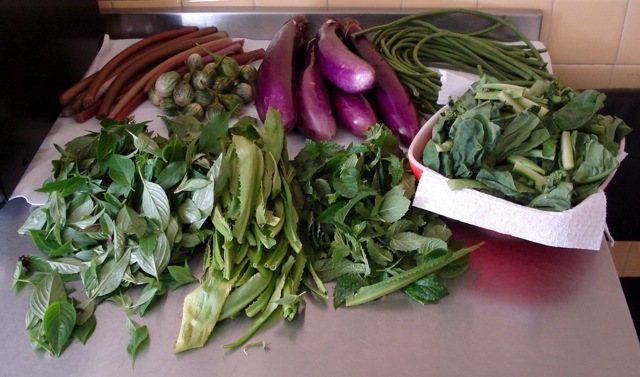 I had variations of this dish in Chiang Mai, though with holy basil instead of cilantro, and so I subbed that in. 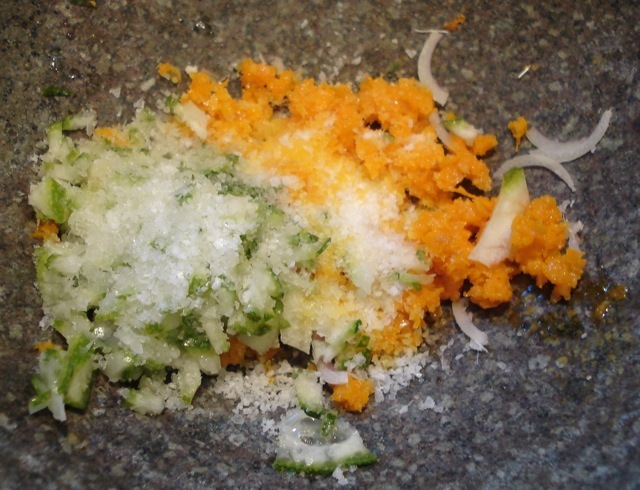 I also added a couple of minced kaffir lime leaves -- again, like the coriander root above, to add a bit of an edge. Though it looks like -- well, you know what it looks like -- it's a truly classic dish. The key is to let the pork and aromatics fry for a good long while, until the meat has started to brown. That gives a nutty quality to the dish that is lacking otherwise. I added the sugar a bit early, to let it caramelize slightly as well. Lunch note: that pork & eggplant dish reheats extremely well. There's a piece in the latest Bayon Pearnik, issue 156 on the 2nd to last page of the pdf that discusses "Strange Cambodian Foods", written by Steve Hili. It talks in general about the usual sensational items (yes, the tarantula legs do sort of taste like crab) but he dwells upon something I hadn't seen in mainland South East Asia before - chicken fetuses (fetii? fetid?) in the shell, or balut to everyone familiar to the Philippines. Interesting, and I understand ethnography places the Khmer closer to the Malay, so it makes sense. It's just not something I'd thought I'd find there. I should go back soon. I thought the Vietnamese also had a balut-like egg. I vaguely remember seeing Bourdain eating one in Vietnam on Cook's Tour way back when. The Khmer Krom are today an ethnic minority in the Mekong Delta of Vietnam. Long ago, they were perhaps far more significant there, so their situation now is not good. Anyway, they have a neat website with some really interesting recipes, including purely vegetarian ones, quite a rarity in this part of the world. Sorry if I just missed this upthread, but which book are you referring to? She "says they use 90% of the time, duck egg, not chicken. Though there is some chicken done too. You'd have to talk to her cause its a wierd sounding name. duck egg = bong thea kon (something like that). chicken = bong moen kon. " I gave up long ago on transliterating Khmer. note: edited to remove a name I'd missed. Bought the book, and it certainly does. Delicious. Apparently many Cambodian dishes employ fermented fish? I've had a Vietnamese noodle soup that's fermented fish-based and apparently it's Cambodian in origin (therefore, it's Cambodian and not Vietamese I guess?). Pungent -not the greatest pleasure to smell it -but the dish has a real depth in flavour and is absolutely addictive once you develop a taste for it! Fermented mudfish appears in many of the Khmer recipes I've been seeing, providing that umami boost with or instead of fermented shrimp, fish sauce, and so on. Last weekend I spent some time making a few different Khmer dishes from Riviere along with the chicken samla in Hot, Sour, Salty, Sweet. I didn't take photos of the final dish but I did take a few snaps of the prep. Chris, I think those shrimp fritters look wonderful -- to me, they don't look malformed, they just look like they have nice meaty parts and lovely crispy bits. 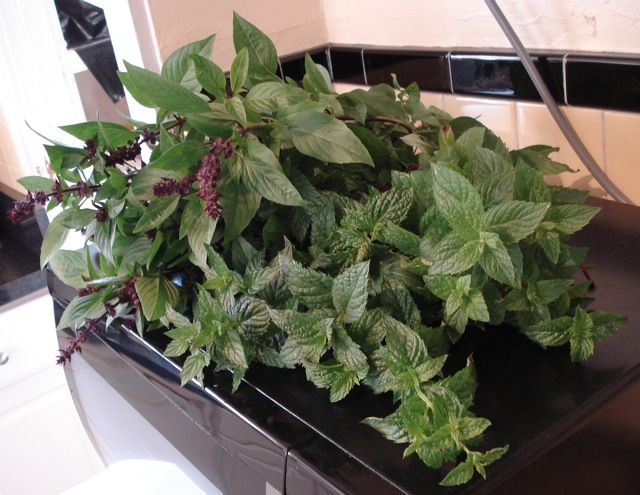 Not to digress, but your Thai basil looks beautiful. The stuff I grow here has such tiny leaves. What variety are you growing? What's your secret? I want to try to make fish amok (after those tasty photos), and was looking for a light vegetable dish to accompany, and serve as a counterpoint to the rich coconut sauce. Any recommendations? Any particular Asian greens (and treatment)? Or are such things not eaten in Cambodia? It might be more Viet, but I like a quick stir fry of "water spinach" with my dishes. No heavy sauce, maybe just a bit of nam plaa for salt. Another way to do it is to set up a salad alongside the dish (with rice, of course). I'm running into more challenges trying to learn to cook a lot of this food. For example, at a new Khmer restaurant here in town I had dishes my partner identified as char khwai (fried bread), beef plear (which is in Riviere as marinated beef salad), hae kainge (ground pork & shrimp wrapped in tofu sausage-style, steamed, sliced, and fried), salor majo kroeng (a thick kroeung-based soup with beef and tripe). Any leads on any of the non-plear items? And, while we're on the subject, is plear the same as lok lak? ... while we're on the subject, is plear the same as lok lak? 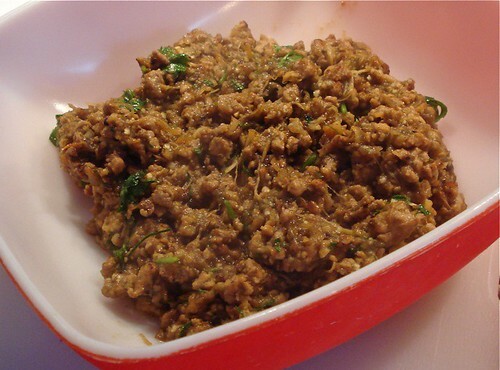 I'm pretty sure Plear is more like a larb: ground meat, mint, lots of lime, pretty spicy. Been a while since anyone has posted in here, but... here goes! 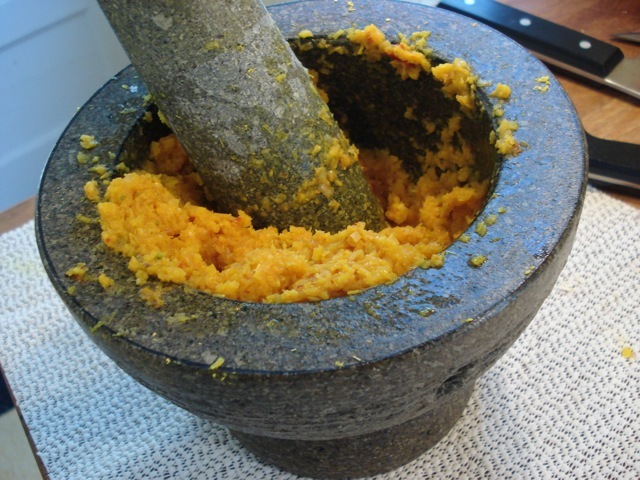 Anyone able to share a recipe for ansom chek? It's sticky rice, coconut, red beans and banana, rolled in a banana leaf and steamed to perfection. It's also served at weddings to represent the groom's "naughty bits"... But I am lacking any more precise measurements. @StephanieGodfrey, does this mean that you didn't take that trip, or that you took it and have happy memories? If it's the latter, we'd love to hear about it. We always love to read about traveling....especially if there are photos that can help us visualize your experience.